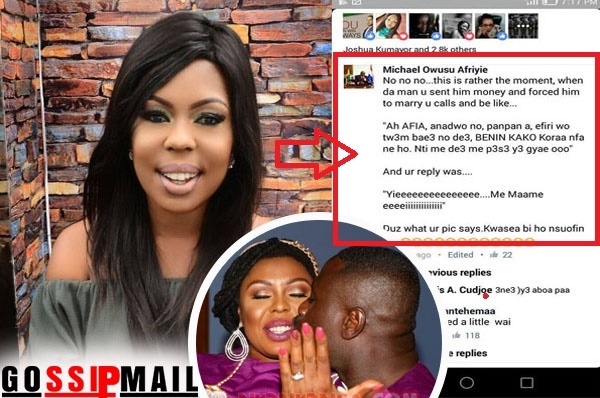 A fan has accused TV and radio personality Afia Schwarzenegger of bribing her husband Lawrence Abrokwah before their recent marriage took place. According to the fan Michael Owusu Afriyie who has been constantly attacking Afia on her Facebook page over her marriage to Abrokwah, Afia paid her own dowry and bribed the man to marry her. Apart from leveling these allegations against her, Afriyie described Afia as an unpleasant woman for any man to make love to.